What It’s About: Fred Dobbs (Humphrey Bogart) and Bob Curtin (Tim Holt) are down-on-their luck Americans looking for work in Mexico. 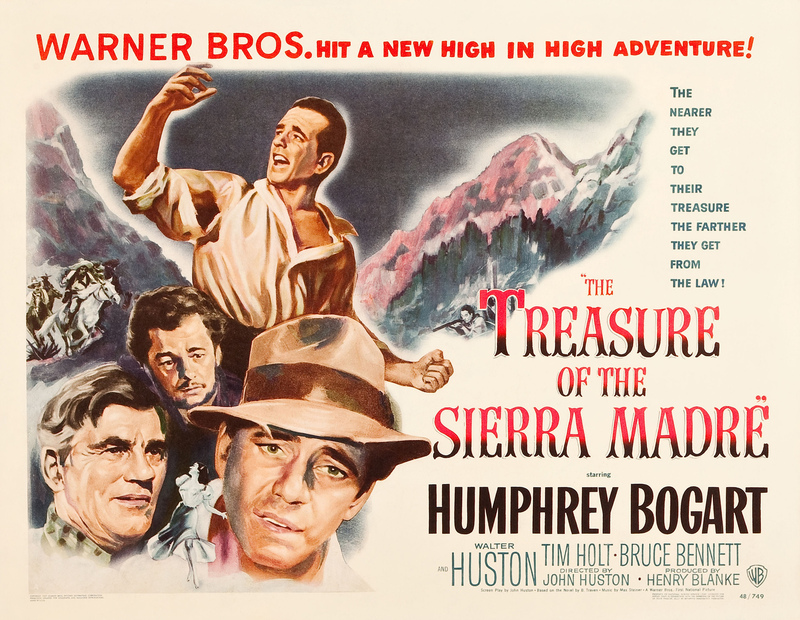 When a lottery win gives them the means, and old-timer Howard (Walter Huston) gives them the knowledge, the men set out to the Sierra Madre to prospect for gold. Surviving the harsh mountains, bandits, and the dangers of mining will be difficult, but the greater trial will be one of character: can the men remain allies and friends in the face of The Treasure of the Sierra Madre? Why Watch it Today? : Composer Max Steiner died today in 1971. Steiner was the composer for many classics, including The Searchers, King Kong, Casablanca and today’s film. The Treasure of the Sierra Madre is one of the all time best adventure films, with great performances from its three leads anchoring a character study that follows how striking it rich effects each of the main characters. This entry was posted in Adaptation, Adventure, Based on a Book, Black and White, Buddy Flick, Drama, Movie of the Day, The Original, Tragedy and tagged banditos, bandits, Best Adapted Screenplay, Best Director, Best Picture Nominee, Best Supporting Actor, children of famous people, double cross, fate, gold, greed, Humphrey Bogart, Jack L. Warner, John Huston, lottery, luck, Mexico, mine, miners, old timer, prospectors, Tim Holt, train, train attack, train robbery, village, Walter Huston, Warner Brothers. Another film where “perfect” is the least you can say about it. That big twisteroo with Dobbs still gets me, as it’s unexpected and I can’t imagine how audiences must have taken it at the time the film was released. It absolutely is; aside from the dated and surely offensive depictions of the bandits and the villagers I would be hard pressed to think of anything someone could criticize it for. I saw it knowing nothing about it at all and it blew me away. I was probably in middle school. I should probably be thanking my older brother and father in here somewhere for exposing me to great movies like this early on.